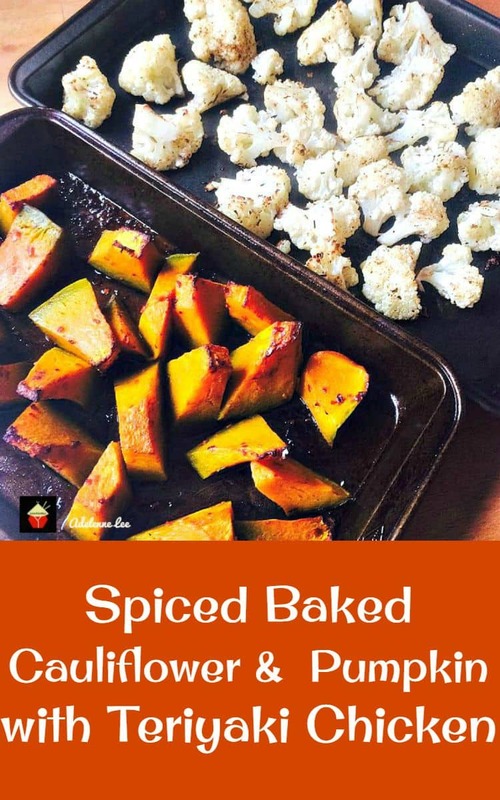 Spiced Baked Cauliflower and Pumpkin with Teriyaki Chicken. This is a lovely flexible recipe which you can make for parties, or serve as a main meal. Easy to do and good for making ahead too! 1 Chicken Breast or 2 Boneless Chicken thighs, cubed. 1. Cut the cauliflower in to small florets. Cut the pumpkin in to wedges. Try and keep them all a similar size so they cook evenly. 2. Place the cauliflower on a baking tray and add the seasonings and olive oil. Mix (easiest to use your hands) so everything is nicely coated. Do the same for the pumpkin wedges in a separate pan. 3. Place in a pre heated oven at 425 F or 220 C and bake. The cauliflower should be ready after 20 minutes and the pumpkin ready after about 30 minutes. In a bowl, add all the sauce ingredients and mix. 5. In a fry pan, add the chicken to a drop of olive oil and fry until cooked and golden. Then pour in the sauce and stir, making sure you coat the chicken. When the sauce starts to bubble, it is ready. The sauce will have also thickened. 6. 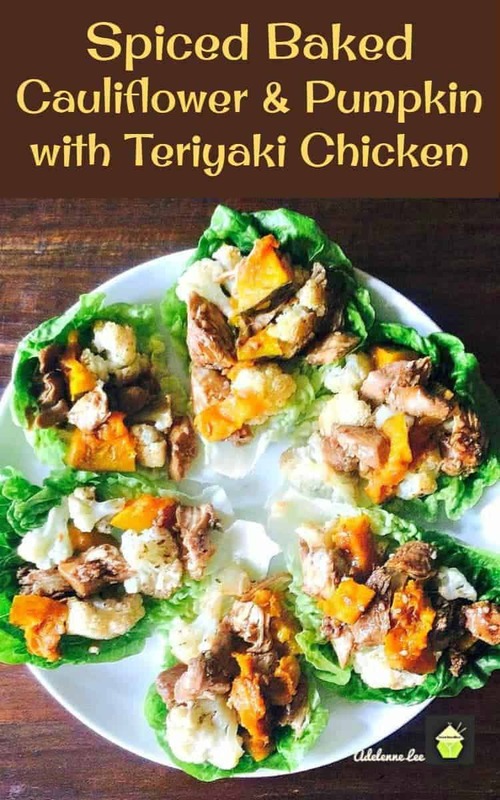 Allow the chicken to cool then assemble the lettuce parcels by adding some chicken, cauliflower and pumpkin pieces and enjoy! 1 Chicken Breast or 2 Boneless Chicken thighs cubed. Cut the cauliflower in to small florets. Cut the pumpkin in to wedges. Try and keep them all a similar size so they cook evenly. Place the cauliflower on a baking tray and add the seasonings and olive oil. Mix (easiest to use your hands) so everything is nicely coated. Place in a pre heated oven at 425 F or 220 C and bake. The cauliflower should be ready after 20 minutes and the pumpkin ready after about 30 minutes. In a fry pan, add the chicken to a drop of olive oil and fry until cooked and golden. Then pour in the sauce and stir, making sure you coat the chicken. When the sauce starts to bubble, it is ready. The sauce will have also thickened. 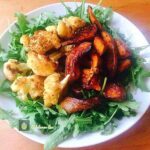 Allow the chicken to cool then assemble the lettuce parcels by adding some chicken, cauliflour and pumpkin pieces and enjoy!